Some DISD parents and activists are demanding changes to what they call unfair school discipline policies that create a pipeline to prison. 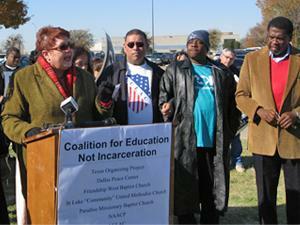 KERA's Bill Zeeble was at a demonstration outside Dallas County's Juvenile Justice Center. Members of a group called the Texas Organizing Project cite a recent Texas study from the Council of State Governments that found more than half of Texas students were expelled or suspended over a 6 year period, and most of them were Black or Hispanic. Bonnie Mathias: Can we honestly believe that fifty-nine percent of children in this state are bad kids and are getting suspended or expelled from school? For what reason? Bonnie Mathias lives in Pleasant Grove. Mathias. : ...kids get suspended from school for a belt being the wrong color! Mathias says she's not talking about serious violations, like assault or theft, but playground fights between 6 and 7 year olds that result in Class C misdemeanors. A student with a record, she says, is on a faster path to prison. Mathias and activists urge a change in what they say is a zero tolerance policy that unfairly punishes too many students. But DISD representative Jon Dahlander says students must take responsibility for their own bad behavior. Dahlander: We have a student code of conduct. Every students is expected to adhere to what's in that book. If you do the right thing, going to class, studying, you're not going to have to worry about these kind of thngs. If you misbehave you're going to pay consequences. Dahlander says the district doesn't like administering punishment, but other students need to be safe in class. He says where the district has discretion, it tries to take it.